This is a pre/post shave formula that readies your skin for a shave, and tones and moisturizes after. With a light scent and just a bit of menthol to refresh, Emulsion can reduce the irritation that shaving causes to your face. It has no complicated ingredients and is perfect for dry or sensitive skin. Plus, it comes in a really cool glass bottle! You’re thinking, “Plastic”? Really? Yes, really! This pink aftershave is not actually plastic, but it improves the “plasticity” of your skin. This means it removes the dead skin from your face and causes your skin to look smoother and more youthful. Containing lactic acid for any blemishes and for tighter skin tone, Plastic Aftershave is wonderful for an all-around smoother, cleaner look and feel to your face. The smell is a mix of a powdery/fruity aroma that will probably take some getting used to, but the results will be amazing! With an old time barbershop smell, this Blue Aftershave also contains a touch of menthol to refresh your skin after you shave. It is more of a tonic, than a simple aftershave and hugely popular in Spain. Agua Balsamica also has the skin toning effect of the other aftershaves, but with notes of rosemary and thyme. The herbal smell is very short-lived and leaves your skin with a fresh feeling…especially nice for spring and summer when a lighter smell is suitable. Take a look at Mr. Miquel’s skin….he is in his 90s and has smooth, youthful skin from using his Emulsion and Plastic Aftershave every day. 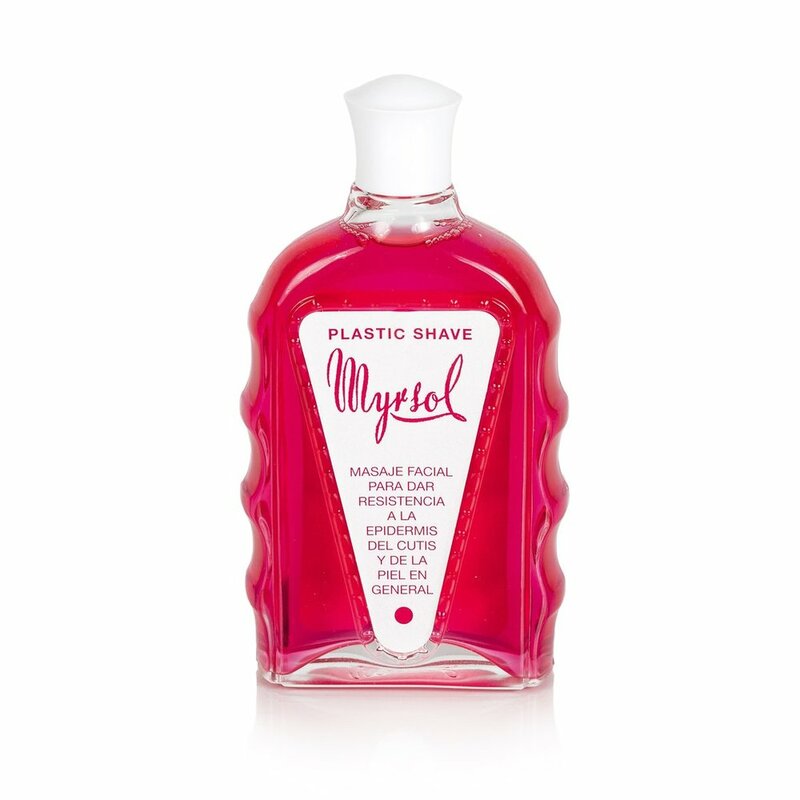 Packaged in a unique glass bottle that is easy to handle with wet hands, the superior ingredients of Myrsol will produce a shave like no other!